The Lingfield Marathon Minibus, which is maintained through local fund raising and grants, has been in continuous service to the community since 1983. The next Quiz Night is on Friday 5th April 2019. Click here to enter! Tandridge District council have agreed that the Lingfield Marathon Minibus will get 50% of any stakes, provided they nominate us, or go via the link below. Please support the Lingfield Marathon Minibus. Enter the lottery now! In 1981 (which was the International Year of the Disabled) a group of local fundraisers led by the late Derrick Delaney formed the idea of the Lingfield Marathon Fun Run, principally to raise funds to provide the village with a minibus. The vehicle was to be equipped with a tail lift to allow wheelchairs access and was envisaged to cater for journeys which those citizens who needed transport for shopping, clubs or seaside trips, school journeys etcetera, could not achieve by public transport. Two years later the original Minibus proudly entered Lingfield and Dormansland to begin service to our community. It was a gleaming new yellow Mercedes 780D long wheelbase model which had been purchased for approx. £23,000.00. Disaster struck in the hurricane of 1987 when three huge trees fell onto the vehicle whilst it was parked over night at the racecourse and it was written off. Reserve funds were low and the impact of the loss of our minibus was overwhelming. The committee were fortunate to be able to purchase a second hand minibus from the Alder Valley Bus Company which was enlarging its fleet. This was made possible with the financial help of two local businessmen who wished to remain anonymous. The Marathon Fun Run in recent years has supported the Minibus project generously and this, together with other reserve funds, enabled the committee to replace the existing minibus in February 2014 with a new Peugeot Boxer 14 seater which will ensure continuation of the dream. The Fun Run has ceased to take place since 2015 and so funds raised from other sources are needed. 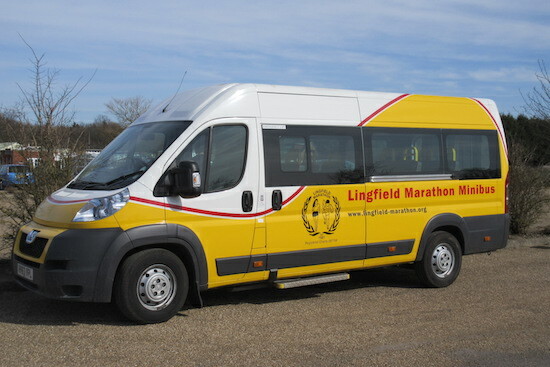 If you wish to donate to the running or replacement costs of the Lingfield Marathon Community Minibus contact the treasurer at mike.bidbury@btinternet.com or, contact Mike Ellis on 01342 870261. The current bus, a Peugeot Boxer conversion professionally 'sign written', with a new and distinctive livery, entered service in 2014. It is fitted with modern electronic extras including air conditioning and meets all VOSA certificated safety specifications. Wheelchair access is made easy with an electrically operated winch and a manual ramp. With a 13 seat capacity (+driver), the bus can be driven by volunteers holding a full driving licence. All new drivers are required to have a familiarisation tour of the bus and must provide driving licence details prior to usage. The bus runs, with the help of volunteer drivers who operate a weekly service to the Lingfield Lunch Club followed by the Derby and Joan Club both of which are held on a Tuesday at the Lingfield and Dormansland Community Centre. Twice monthly shopping trips, one to Oxted and one to Crawley are also provided by volunteer drivers. 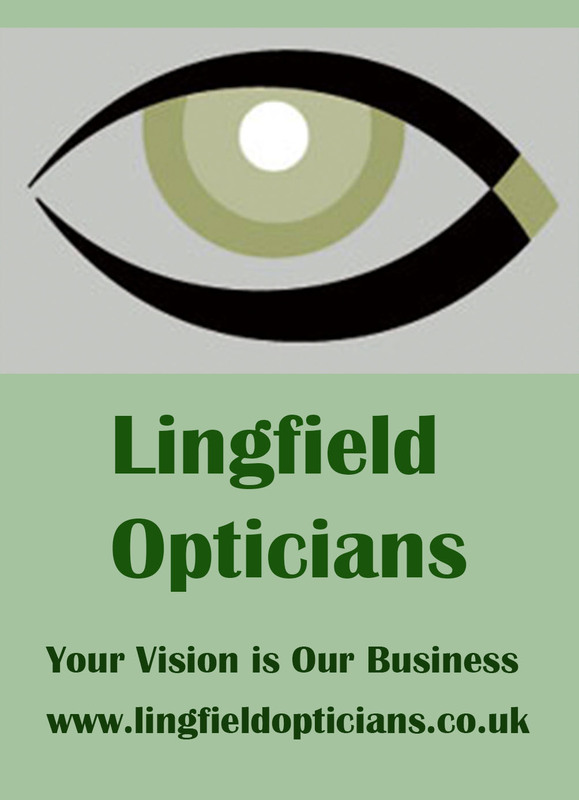 Details of these services can be obtained from the Lingfield and Dormansland Community Centre, enquiries@lingfieldcentre.org or on 01342-833893. The bus is also available for charity work in the Lingfield area and for hire. All enquiries to mike.bidbury@btinternet.com or, contact Mike Ellis on 01342 870261.